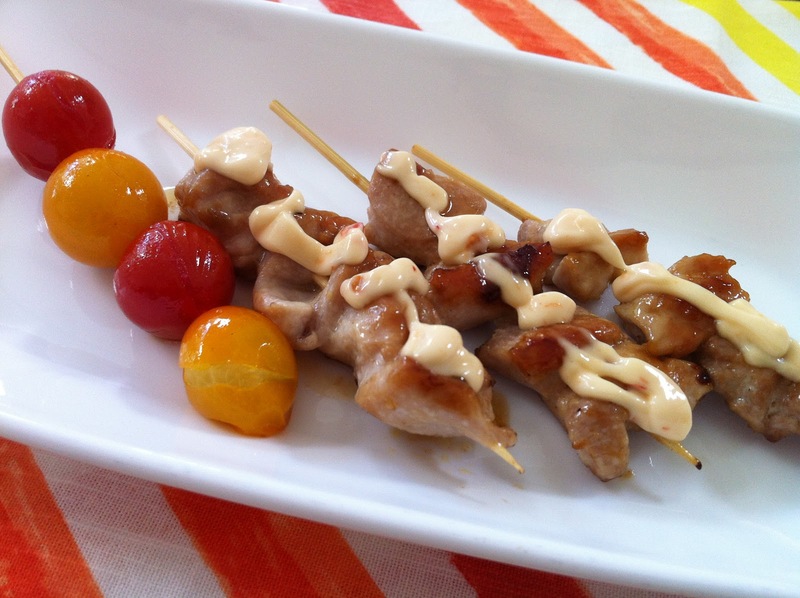 yakitori with spicy mayo sauce | what is clara eating today? In a small sauce pan, boil ponzu sauce, Truvia, garlic, and ginger for 3-5 minutes until the amount has reduced to about 1/2. Set aside. Thread the chicken pieces into skewers. Heat canola oil on skillet (if using grill, brush on the chicken). Cook both sides without any sauce, then brush the sauce on, turning until done. Make spicy mayo sauce by mixing the ingredients. Pour into a ziploc bag and cut out one corner to squeeze out the sauce over the yakitori. I sometimes use this yakitori sauce to brush onto vegetable kabobs as i grill them. The cherry tomatoes in the picture were grilled together after brushing on olive oil.